Huge congratulations on your progress so far thats a fantastic achievement. The doms in time do fade but whenever you add in a new exercises or change your training variables they can come back but all part of the process. I would recommend if you are training for health and golf you seek a screening protocol from a TPI specialist in your area. Generally speaking most of the general population have the same body limitations but it is always god to know what exercises you should and shouldn't be doing based on your mechanical profile. Also its always good to know what exercises you can add into the mix to help address these issues which can have a huge impact on both your game and health. Keep up the good work though. Thank you for the heads up. Very new to this and was unaware of this rule. I have made adjustments and I hope these are satisfactory? Hi all, I just wanted to introduce myself. I'm Olly Foster creator of the Golf Fit by Olly program. The program is an online training and nutrition plan that last 12 weeks designed to get you moving, feeling, looking and playing better golf. I'm a fully qualified PT with over 17 years experience in the industry and am also TPI qualified. I have only been playing golf myself for 2.5 years now and currently Im playing of 11 at The Shire in Barnet / London UK. With my passion for the game and the fitness industry I wanted to put together a plan that was both affordable and effective on a larger scale. Below are my views on Golf Fitness and it's importance within our game. The Importance of Golf Fitness Golf fitness has been a hotly debated topic of discussion over the years with many believing its role within the game isn't of importance. If you know anything about the human body and how it moves and its requirements to function with daily day to day tasks, you will understand that anything you can do to improve this will benefit you. Society these days has been designed to de-condition us, it's a simple as that. Almost 95% of clients I screen on a weekly basis have some form of dysfunction or mobility issues due to the nature of their work or daily habits. Taking these dysfunctions onto the golf course is only going to compound these problems and lead to inconsistent play with a high risk of injury. Golfers of all levels would benefit from some form of Golf Specific conditioning based training. Whether you believe it or not, golfers are athletes and in order to improve you must train like one. 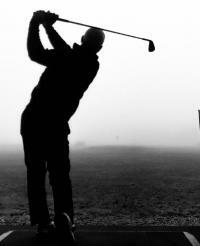 The stresses and demands placed on the body when swinging a golf club are way more strenuous then you think. These physical demands place huge strains on the body's musculature system and if you combine this with mechanical deficiencies and faulty loading patterns, you are almost asking for an injury. Common injuries being the lower back, shoulders, elbows and knees. The key components to any golf swing are Stability & Mobility, (Flexibility & balance) Posture, Strength & Power (mainly rotary) and when these elements work in sync this will in turn lead to higher level of swing efficiency with greater swing speeds, meaning you will hit the ball further and more consistently, the holy grail of golf! However, most golfers overlook these areas for a whole host of reasons but mainly in fear of ruining their current swing and thus seek to continually change clubs in hope that this will fix the issue. It wont! You need to start investing in yourself both in terms of training and nutrition if you are serious about getting better and playing the game for longer. I believe any golf fitness program that helps address these issues when coupled with an effective nutrition plan, will not only begin to get you looking better, but feeling better and ultimately playing better. Feel free to comment on this article or ask me any questions you may have with regards to your own fitness goals. I will do my best to answer them in as much detail as possible as and when. Any feedback is also welcomed.